Frigs are forever exploring. 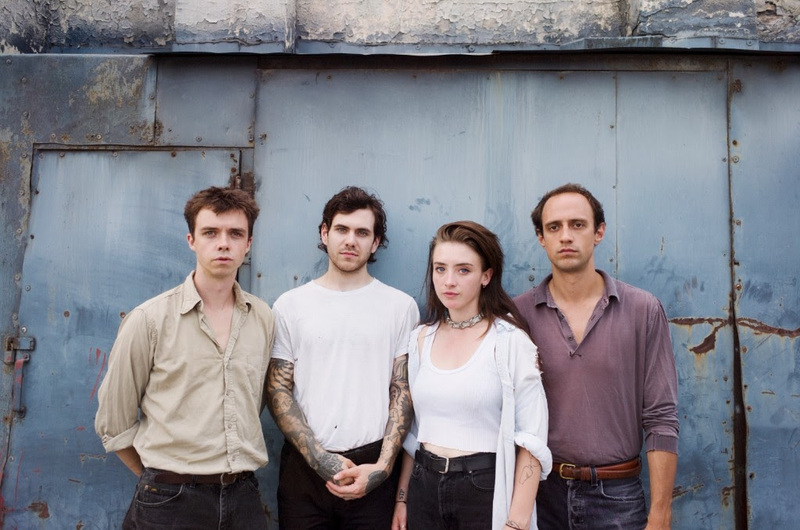 Sure, each song from the Canadian four-piece feels like a short, sharp, shock, but the way the music tumbles inward and rises outward, veers left and surges right, seems to break every rule going, and establishes a few new ones in the process. The band hinges on the friendship between Bria Salmena (of shrieking vocals) and Duncan Hay Jennings (of shrieking guitar), two musicians who met while studying at Montreal’s Concordia University. Although the project only got off the ground during their final months in the Francophone city, their boundary-less post-punk owes a debt to Montreal’s atmosphere of freewheeling creativity. A band with deep roots in the Canadian underground, Frigs started off by playing shows with friends, an anything-goes atmosphere that allowed their fetid post-punk to expand in curious directions. Debut album ‘Basic Behaviour’ is fascinating; it’s visceral, for sure, but beneath those barbed wire riffs lies a real intelligence, an incredible intent of purpose. A record that continually criss-crosses itself, ‘Basic Behaviour’ is like a post-punk Escher puzzle. Self-produced with the assistance of engineer Ian Gomes, it’s the result of countless rehearsals, practices, and recording sessions. “We have been working on the record for a while,” Duncan says. “But I think the record is of two halves, in our minds. It was recorded in two very different settings. One being a home studio that we had set up, and then the other half-finished in a full studio”. A ten track blast of noize, ‘Basic Behaviour’ keeps its literary streak hidden – yet if you search for it, it’s there, just underneath the surface. Album standout ‘Doghead’ for example, was directly inspired by a Nick Cave novel, a moment when life, art, and studio intent click into place. Out now on Arts & Crafts, ‘Basic Behaviour’ opens a key chapter for the Canadian group, with Frigs plotting their first trip to Europe later in the year. Audiences are in for something special, too, with their chaotic but supremely well arranged post-punk puzzles jettisoned with absolute fury. It’s an energy that in turns influences their songwriting, and is a factor in their debut’s striking sound and approach. Headstrong and resolutely independent, Frigs need no blessing but their own. 'Basic Behaviour' is out now.